A daily oral hygiene routine is paramount to good dental check-ups. Brushing, flossing, and dental rinses are recommended to meet your dental health requirements. Let Dr. Walker and her dental hygiene team answer any concerns you may have about your oral hygiene! Make your appointment today! For residents in Kernersville, Winston-Salem, Greensboro, High Point, and surrounding towns, we provide general dentistry. If you need regular checkups, periodontal therapies, or other dental services, contact us! Regular dental check-ups and your personal dental hygiene are key elements to achieving a healthy, beautiful smile. Dr. Veronica Walker recommends that her patients have dental check-ups at least twice a year. She will examine your mouth, teeth, and gums, inspecting for cavities, gum disease, screen for cancer, and order digital X-rays to aid in her diagnosis. 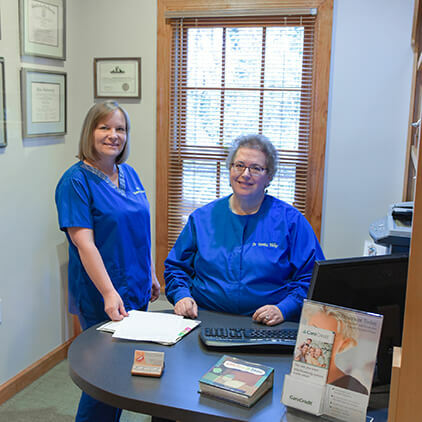 The dental hygiene staff at the office of Dr. Veronica Walker in Kernersville, NC will provide the prophylaxis, or dental cleaning, appropriate for her patients. We may recommend sealants to prevent tooth decay in adults or children. Kids are often more prone to tooth decay because they are still developing their oral hygiene skills, but adults who regularly suffer from cavities may want to consider dental sealants as well. The process is quick and simple, and we can apply dental sealants during any six month dental checkup. We paint the liquid sealant onto the surfaces of teeth where it seeps into the pits and grooves in the smile. Once in place, we use a curing light to harden the sealant. With proper care, dental sealants will protect your teeth from decay for years to come. The temporomandibular joints (TMJ) connect the jawbone to the skull, allowing the mouth to open and close without pain or obstruction. 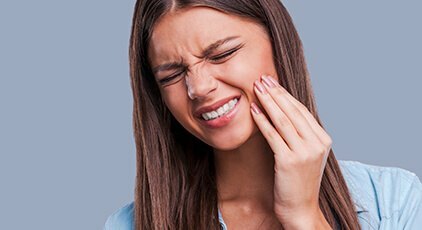 When these joints are strained or damaged, the result is TMJ dysfunction, sometimes referred to simply as TMD. Bruxism is the unconscious grinding and clenching of teeth that occurs most often during sleep and can cause wear or damage to teeth. While these two oral health conditions do not necessarily have related causes, you may be able to treat both TMD and bruxism by wearing a comfortable, customized nighttime mouthguard. These nightguards adjust the jaw to rest in its most comfortable, pain free position relieving undo strain on the TMJ. The nightguard also places a physical barrier between teeth preventing damage from nighttime teeth grinding. Oral cancer often goes undiagnosed until the most advanced stages of the disease, leading to a high mortality rate. More than 50% of those who are diagnosed do not live more than five years beyond their diagnosis. That’s why oral cancer screenings have been incorporated into every dental checkup at Dr. Walker’s office. Our hope is to diagnose oral cancer in the earliest, treatable stages. 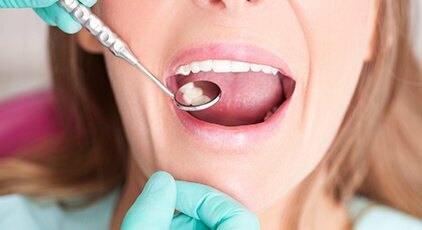 If you notice any of the warning signs of oral cancer such as lumps or bumps in the soft tissue, chronic sore throat, hoarse voice, and sores that don’t heal, please let us know right away. As teeth develop, fluoride is one of the many nutrients our body needs to create strong, healthy dental structures. We absorb fluoride from certain foods, tap water, and through ingested supplements. Once teeth erupt from the gums, topical fluoride is necessary to keep tooth enamel strong. Many people receive adequate topical fluoride by using fluoridated toothpastes and mouth washes. Others need a little extra boost to keep their smiles strong and healthy. When that is the case, we may recommend professional grade topical fluoride treatments to promote strong, healthy tooth structure. We are happy to apply topical fluoride as part of any dental checkup. These treatments are simply painted onto the surfaces of teeth. Once the fluoride dries, it remains active attracting strengthening nutrients to the smile over the course of the months between appointments. Periodontal disease generally has no symptoms. 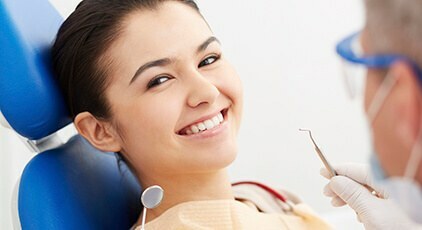 Therefore, it is important to have regular dental exams and cleanings. At the office of Dr. Veronica Walker, our intent is to prevent and treat early gum disease. In the earliest stages, gingivitis, gum disease can typically be treated with more frequent professional cleanings. As the disease advances, gums and supportive alveolar bone tissues begin to break down creating pockets of space between the teeth and gums that allows teeth to shift and may even lead to tooth loss. In the advanced stages, known as periodontitis, we will recommend more thorough treatment options. 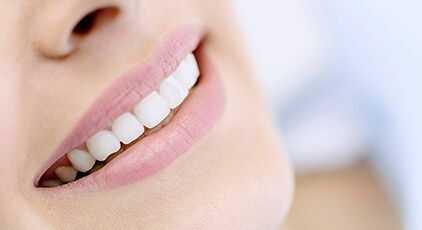 We start with scaling, the systematic removal of plaque, tartar, and damaged tissue followed by root planing, the smoothing of tooth roots to prevent future buildup. In combination with improved at-home hygiene and more frequent professional cleanings, we are typically able to bring even the most advanced cases of periodontal disease under control.